I LOVE this card! I have been anxious to use this set, as I just received it a couple of weeks ago and finally got it assembled yesterday. I think this damask image is so elegant... I made this card for this week's Clean and Simple challenge on Splitcoast, which is a sketch challenge. 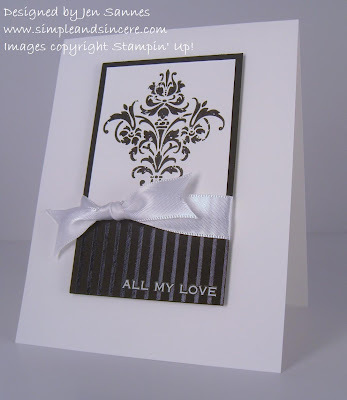 Love the color combo and the simple elegance of the damask stamp. I love that stamp set too, it is so versatile! TFS! I LOVE black and white cards, they are so striking!